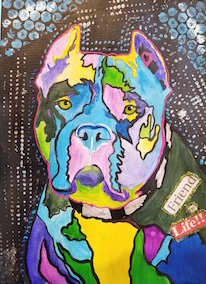 Join artist, Norma Tolliver, as we create a one of a kind, mixed media portrait of your pet. Starting with a black and white print on watercolor paper, you will use acrylic paints, stencils and paint pens to bring the portrait to life. Options for matting and framing your finished work will be discussed. Finished portraits are on 8 .5” x 11” watercolor paper. 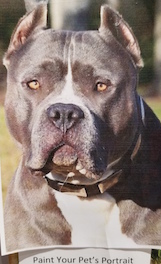 You must email instructor a clear photo of your pet 2 days prior to class. Image needs to be high resolution, at least 1000 x 1000 pixels. Please email images to mainavegalleria@gmail.com. Saturday, February 9th from 5:00pm – 7:30pm. For ages 13 – Adult. NOTE: Online registration closes two days prior to the start of this workshop.